Paramount Pictures International (PPI) and Marvel Studios announce a competition inviting residents of the online community Second Life to create jaw-dropping Iron Man fan art for the chance to win a top prize of L$100,000 (US $400). Competition entries can take the form of still artwork or moving image – the only limitation is that each entry must make use of an official Second Life avatar created to promote the hugely-anticipated worldwide release of IRON MAN on Friday 2nd May. 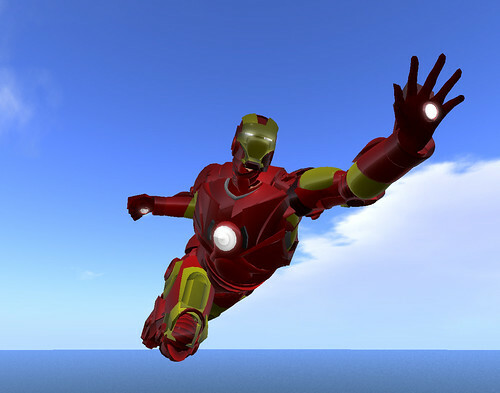 The avatar is freely available to any of the Second Life’s 13 million residents, bringing Iron Man to life for his fans by enabling them to take to the virtual skies, piloting his suit and experiencing his powers for themselves. The avatar can be collected from Silverscreen island in Second Life. Visit Silverscreen by following this link – http://slurl.com/secondlife/Silverscreen/195/106/29/ – and signing into your Second Life viewer. Entries must be emailed to silverscreen@theppc.com by 7.00 PM PST on Wednesday 7th May. Finalists will be announced on the Silverscreen blog at www.theppc.com/silverscreen the following day. Friday 9th May. The winner will receive L$100,000 and the runner-up will receive L$25,000. All the finalists will see their work displayed and open to the public in Silverscreen throughout May. PPI will also be unveiling a machinima promo commissioned to show the avatar in action, created by multimedia artist and video director Annie Ok. The av is being designed and built by Jonny Dusk, creator of the official Bumblebee av we developed to promote the release of TRANSFORMERS last summer, working in conjunction with virtual world content creators V3 Group. We’ll also shortly be announcing a contest open to any SL resident with the IRON MAN av, a great eye for an image and the power of their imagination, with L$100,000 in prizes up for grabs. Synthetic Times: Media Art China 2008, a Cultural Olympics project that will open at the National Art Museum of China in Beijing in June 2008, launches in NYC with programming co-organized by the exhibition’s curator, Zhang Ga, the MoMA, Parsons School of Design and Eyebeam. On April 15, following a day-long symposium at Parsons, Eyebeam will feature a performance of Invisible Threads by Eyebeam artists Jeff Crouse and Stephanie Rothenberg, as well as performances by Taeyoon Choi and Friedrich Kirchner, at 8 – 10PM. Invisible Threads installation at New Frontier on Main at Sundance ’08.